Coil the chenille stems around your finger to create a spring like cover for your finger. I used Yellow for the chick, white for the lamb and blue for the bunny. For the Bunny: In your chosen colour, cut 2 x 5cm lengths to be folded to form bunnys ears. 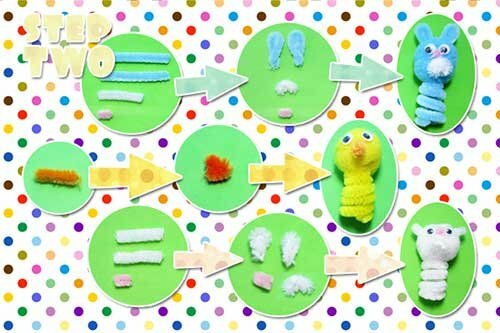 Cut a length of white chenille stem (about 3cm) and curl it into a circle or oval shape for the mouth / cheeks. Cut a very small length of pink chenille stem for the bunnies nose. For the Lamb: Cut 2 x 2cm lengths of white chenille stem to be folded to form lambs ears. 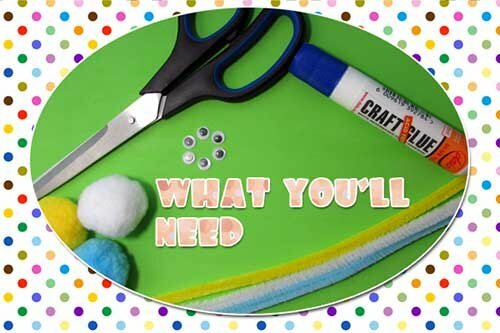 Cut another small length of white chenille stem (about 3cm), and curl it into a circle or oval shape for the mouth / cheeks. Cut a very small length of pink chenille stem for the lambs nose. 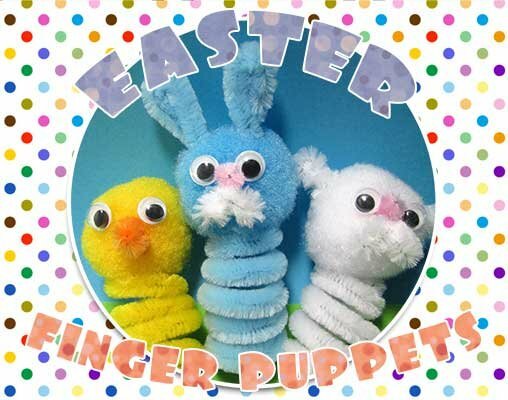 For the chick: Cut a small length of orange or red chenille stem and create a small v-shape to be stuck on as a beak. 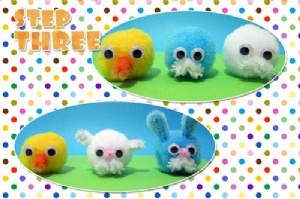 Glue your lambs, bunnys and chicks mouth parts onto each of their faces / pom poms. After you are happy with their placement, glue the googley eyes onto their faces. Next position and glue on your animal characters ears. Wait about 5 minutes for this to dry a little and then proceed to stick the completed heads onto the coiled chenille stem bodies you made earlier. 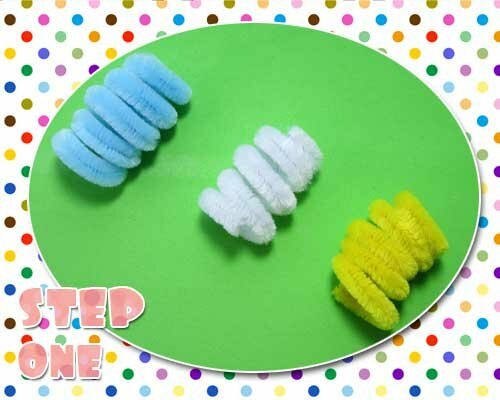 Bunny and lamb - Cut a small length of white chenille stem to curl into a round shape to stick on as a tail. Chick - Cut two small lengths of chenille stem (4cm) to create wings.